With the changing season and the warmer weather, the insects are making their appearances once again. 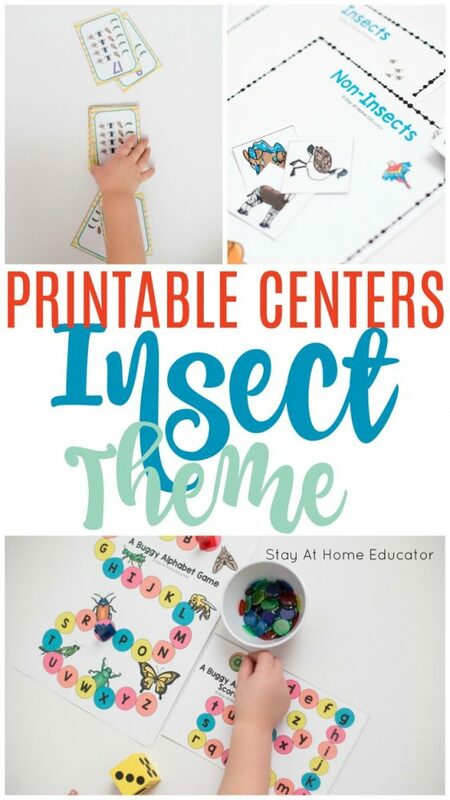 If you’re looking for some printable centers to add to your preschool insect theme, here are six printable insect activities for preschoolers. Are you an insect lover or do you cringe when a preschooler comes in with a rollie-pollie? I’m a little in between. While I don’t squirm and wriggle out of my seat at the sight of beetle, I don’t seek them out for intense observation. My two little boys are both obsessed with any form of creepy crawly and delight in any bugs they can find. In fact, one of my boys asked if we could add some giant logs to our backyard landscaping so “then the bugs will have more places to live and play.” He said it so matter-of-factly. And truth be told, I kinda’ love the idea of have two giant criss-crossing logs along the back fence line where we can sit around a camp fire, or the kids can balance on and jump off of. But then my son brings that black skittering beetle into my house and maybe I squirm a little bit, because, well, “insects don’t belong in the house!” My words, not his. He carries worms in his pockets, too. 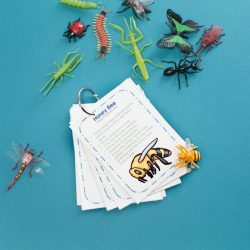 All that said, I do love inviting printable insect activities into my home, especially during the spring and summer months! Insects really are fascinating, and curious little preschoolers understand that the very best! 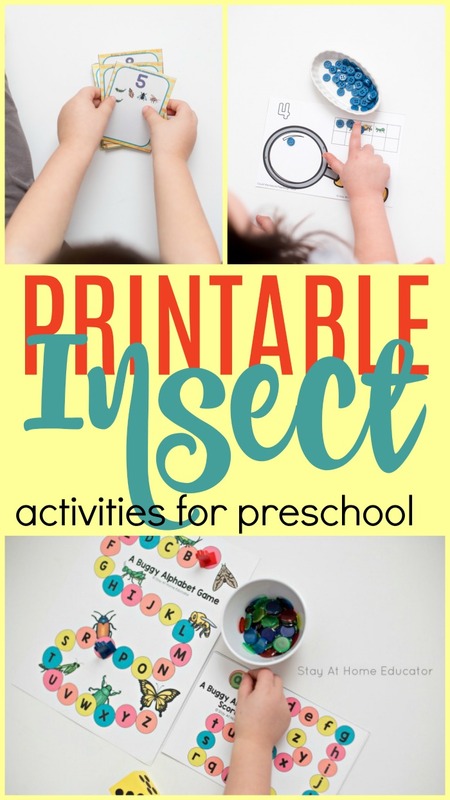 These printable insect activities for preschoolers are designed to be low prep and used over and over again. 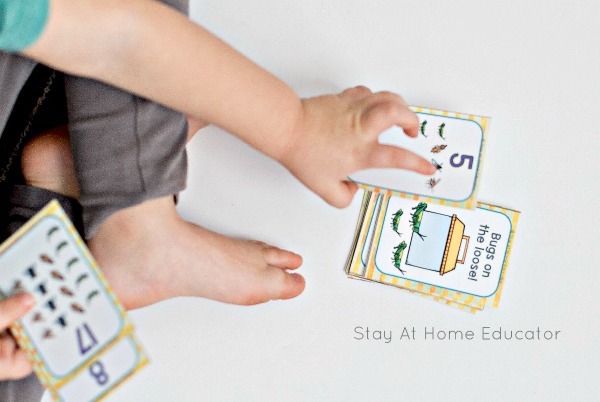 Each one helps strengthen an important skill, like counting, number recognition, alphabet or fine motor skills! 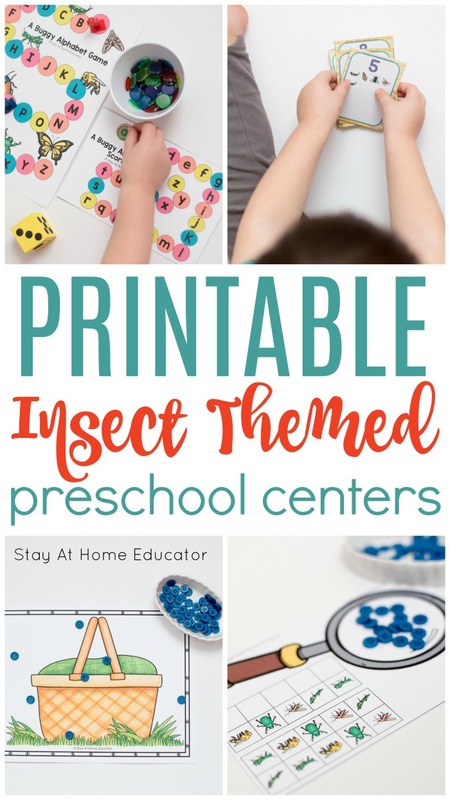 They work well for preschool centers, small group work, and even circle time activities for your insect theme. I also love them because they can be used with a variety of different manipulatives! All 6 of these activities are incredibly low prep. That being said, on top of the required prep, I like to laminate activities. This is completely optional but helps to preserve the life of the activities. Not only does this help keep activities safe from little hands, and the messes that come with them, but it allows the activity to be used with ‘messy’ items. This could be candy or playdough that could ruin a plain piece of paper but works great with lamination! 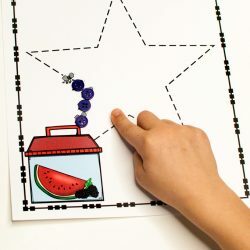 If you prefer not to laminate, but want to use playdough with activities like these, we have also used dry erase pouches and they work great too! Preschoolers sort insect and non-insect picture cards onto mats. 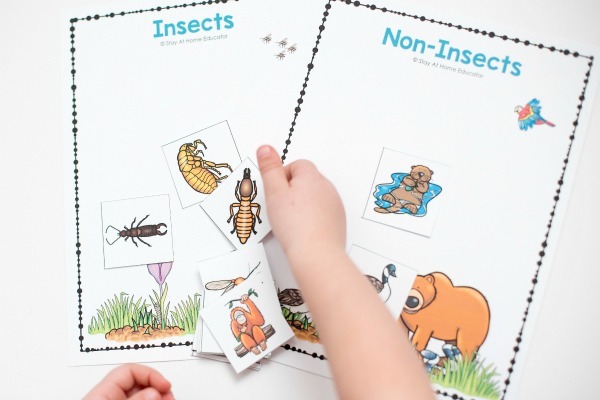 This helps preschoolers learn and recognize the key characteristics of insects. 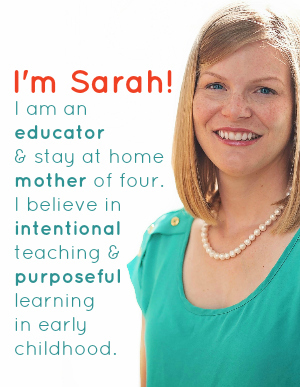 This can be done individually, in pairs, or even for circle time. This activity is incredibly simple to prep. The only thing that needs to be done is to cut the insect and animal cards into individual pieces. Once they are cut, the sorting game can be played over and over! This card game will have your preschoolers giggling and smiling as they draw cards to identify numbers. 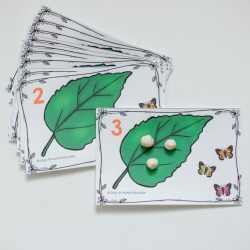 Each number card also has the quantity, so preschoolers can count the insects on the card if they don’t immediately recognize the number. If the preschooler identifies the correct number, or counts the correct number on the card, then they get to keep it. But, if a ” Bugs on the loose!” card is drawn, then the preschooler must say something like,” Eep!” and return their number cards to the draw pile. The first step is to print two copies of the game. Much like the sorting activity, the first step is to cut the cards. Shuffle the cards and place all the cards into a pile, we call it the draw pile. One play draws a card, identifies the number and speaks the number out loud. If needed, children can use the insects to help by counting them. Once the number is identified, the player keeps the card and it is the next person’s turn. If a “Bugs On The Loose” card is drawn, then the player looses all of his cards and they go back into the draw pile. For children who need extra challenge, children can add up the cards that they pull. Nothing spoils a picnic more than ants! 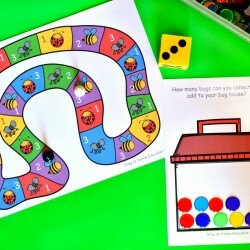 In this insect counting game, preschoolers grab a set of ten buttons (or you can use beans) to represent ants. Starting with elbows in the table, gently drop the “ants” onto the mat. Then, the preschooler counts how many button fell onto the picnic basket versus those that did not. 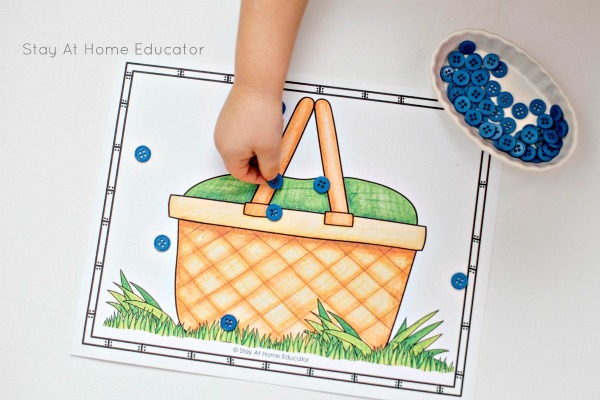 If you have an older preschooler, this is a perfect activity for teaching preschoolers the basic concepts of composing ten. Preschoolers role the dice and move their game piece along the path while practicing recognition of letters. When a letter on the game board is identified, then find the corresponding lower case letter on the score card and cover it with a counter. The goal is to identify and find as many letters as possible. Children can move in any direction to try to get all of the lowercase letters covered. This game is especially great for teams or small groups. It can teach team work in order to get all of the lowercase letters covered. 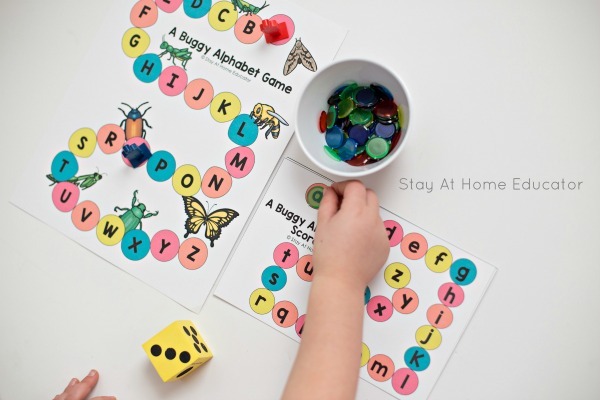 This insect alphabet game is so fun! 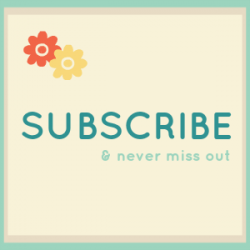 Arrange a set of 3-5 cards in sequential order and place them in a pocket chart or on a table. 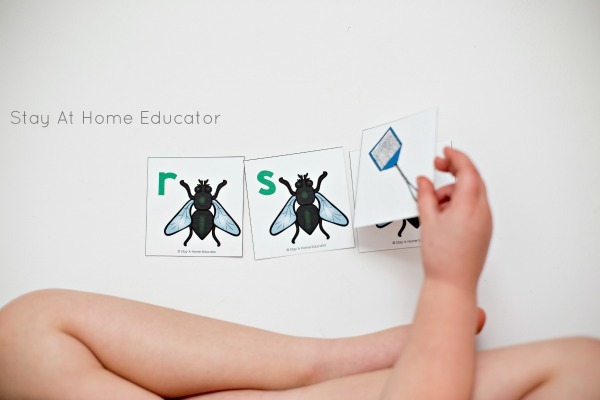 Ask your preschooler to close his or her eyes while you take the fly swatter card and cover one of the letter cards. Then invite your preschooler to open their eyes and identify the covered letter. This game is increasingly difficult if starting in the middle of the alphabet rather than the beginning. The order of the cards does not need to be in alphabetical order, you could start with an h, i or z! Preschoolers get to pretend to look at bugs under a magnifying glass while practicing number identification skills. 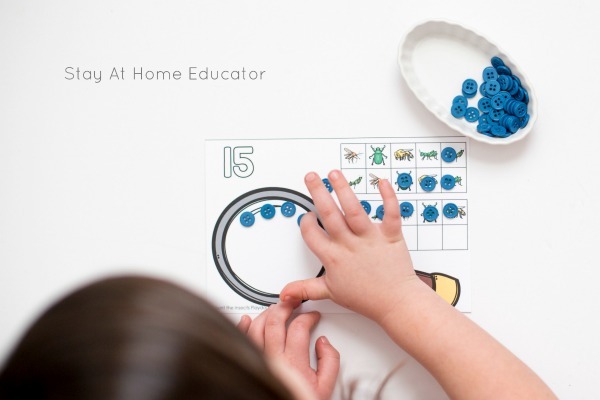 Count the number of insects in the ten frame and place a counter or ball of playdough on each insect while counting, thus getting in some extra one to one correspondence practice. Then, identify the number on the mat. They, of course, should match. Then move the buttons or balls of playdough onto the magnifying glass for another round of counting practice. The numbers on the mats are in a puffy font, too, which means your preschooler can also get in some extra fine motor work by rolling snakes and forming the number out of playdough. It could also be a really fun to have a children’s magnifying glass to add a little extra to the activity. This is NOT necessary, though! This is one activity that I would especially laminate. When using playdough, it will ruin the paper almost right away. 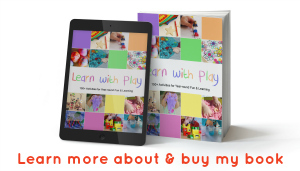 When laminated, though, the playdough can be pulled and wiped off simply! 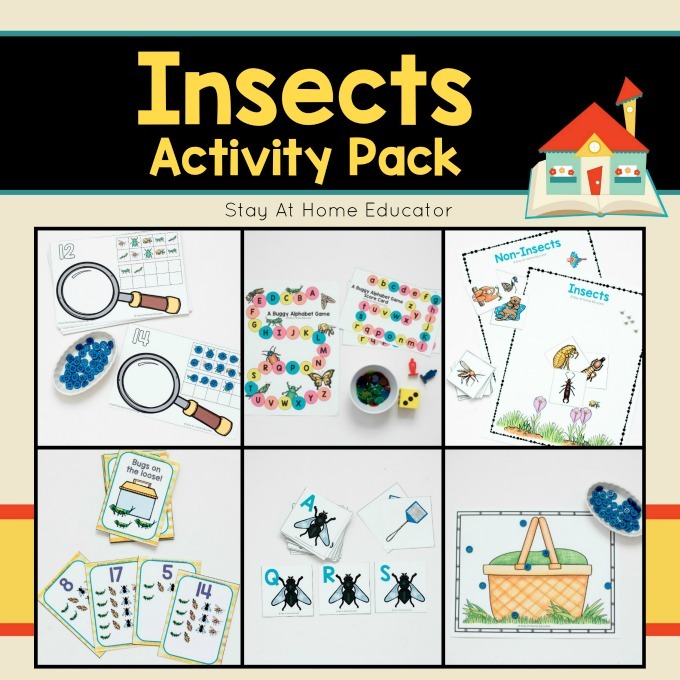 These insect activities are not only fun and engaging but help teach and strengthen important skills for preschoolers! Grab your Printable Insect Activities Here! 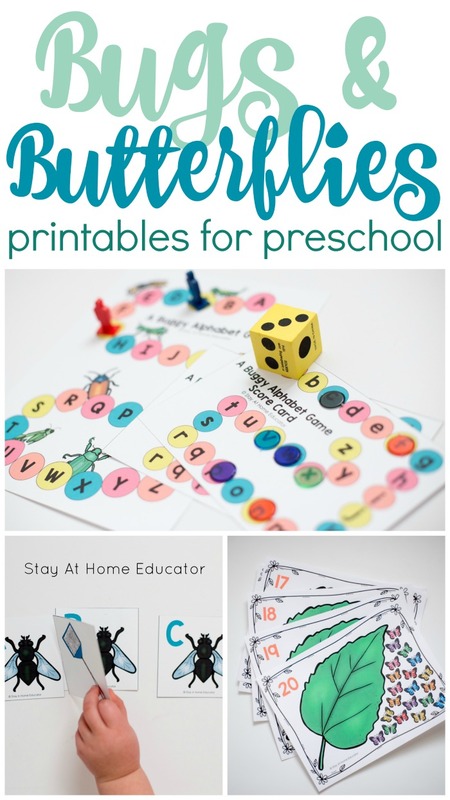 Think these printable centers are something your preschoolers will love while doing your insects or bugs and butterflies preschool theme? You can grab your own by clicking the link or the image below. Then keep scrolling for more printable insect activities. 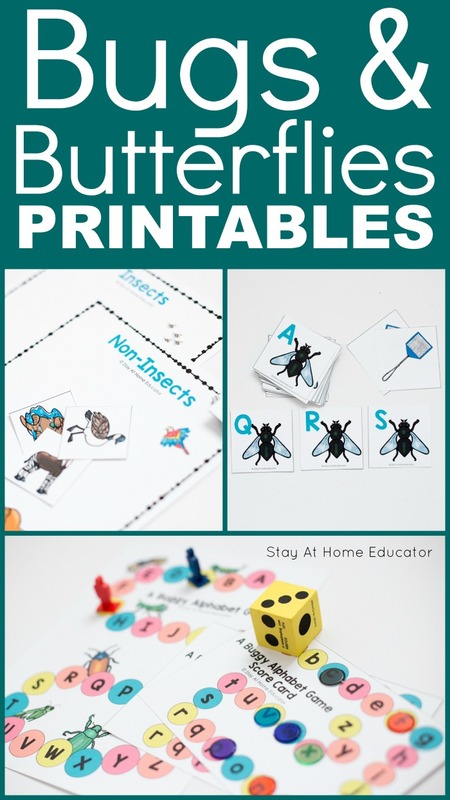 Looking for More Printable Insect Activities? I’ve got you covered! These are some of my most popular insect activities for preschoolers.